Discussion in 'Gen 2 Prius Main Forum' started by JK_X, Feb 8, 2019. @NutzAboutBolts has a video on AC cleaning, albeit 3rd gen (2010 model year onward), but maybe similar enough. It's linked in a thread pinned at top of 3rd gen maintenance sub-forum. JK_X and NutzAboutBolts like this. Could it be dead mice? They like to live in the ducts around the cabin filter. Getting any cleaner mentioned might be interesting here. The one edthefox likes is not available here. I considered doing that maintenance but came unstuck trying to find the aerosols, or anything equivalent. But back to the OP, yeah either of those options mentioned above are candidates. Maybe find a specialist A/C place and see what they recommend, assuming you have checked the duct work for rodents and not found any. (It is not really a big problem here, as it is some places in the States). 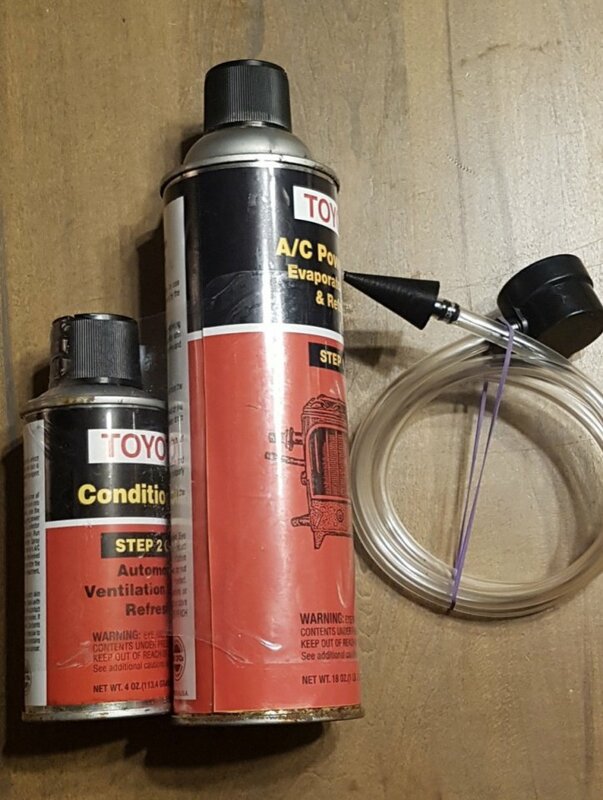 You can buy a ac cleaning kit online or Toyota. Directions on the cans. Mine had a mildew smell it stopped that. It's sprayed in the drain pipe and intake vents. Pretty simple when you get into it. it could be anything but most of the time its molds and mildew build up in your ducts, vents and condensers. Id ask the guys from the dealership or someone more likely a professional detailer that can fumigate or flush your ac/heat vents "the right way." I'm not updated with the new services and formulas nowadays and things that I knew may not the best now. But just to give you an idea what youre encountering, when I use to work at the dealership we always have a warranty coverage and one of those is the same problem you have. We flush the whole ac heater vents with an aerial / aerosol solution. Fumigating process takes about an hour to do it and 3 hours to relieve the agents. This requires a lot of space and time cant do it inside the garage.  I don't want to elaborate the whole process for the knowledge that I may know might be obsolete now and the formulas they use now are more environmental friendly. Atleast this will somewhat connect to the things you mentioned earlier. But I'm telling you man after when you get this thing done, your car smells like on top of the alpine brand new. Chicks love it.. Hope this helps out. The kit has a clear line with a cone attached at the end, insert the cone into the evaporator condensate drain line from below and then discharge 1/2 of the can into the evaporator. Remove the cone. In a few minutes the foam will turn into liquid and it will drain out the line. Attach the cone and repeat. I remove the cabin filter first and replace the filter door. JK_X, SFO and Skibob like this. Nope, checked it today, I think just the molds in the evaporator. I sprayed the air conditioner cleaner seemed to be ok. but not sure the molds were killed or not. Thanks, guys haha. Sorry for some of you can't reply individually. and I'm living in New Zealand and could only find one product for cleaning the A/C. and it doesn't come with the skinny tube. but the effect looks ok so far. I browsed the Aliexpress or eBay but haven't seen any similar products listed there, maybe they aren't allowed to be shipped via air transportation? I turned on the a/c full blast and spayed a boat-load of Lysol disinfectant spray into the intake under the windshield wiper. I kept spraying while cycling through a/c, heat, and just vent. It helped for a week or two, but the musty smell came back. Gave it the same treatment again and the smell has been gone now for well over a year. I think I used about a third of a can each time. The only drawback was hearing my wife's complaints about the Lysol smell for the next week after each treatment. But it was worth it in the long run. 1. Reduce your use of AC, just open the windows some. 2. When you do use it, try to switch it off a mile or so before your destination. This gives the condensation of the AC's grill a chance to evaporate. It's moisture sitting in there for proctracted time that causes the problem. I have never heard of this thing before. Good show. Good like I have to bookmark that site! ... I think just the molds in the evaporator. I sprayed the air conditioner cleaner seemed to be ok. but not sure the molds were killed or not. If you don't mind me asking, what product did you use, and where did you get it? That's the stuff edthefox5 likes and we can't get that here. Thanks anyway, but I was needing somewhere local, as overseas sources won't usually ship aerosols. The cleaning kit in post #8 is a Toyota part. Have you checked to see if the Toyota dealer sells it? It was the first time I was aware Toyota had that as a part. I will be asking the next time I am going past. 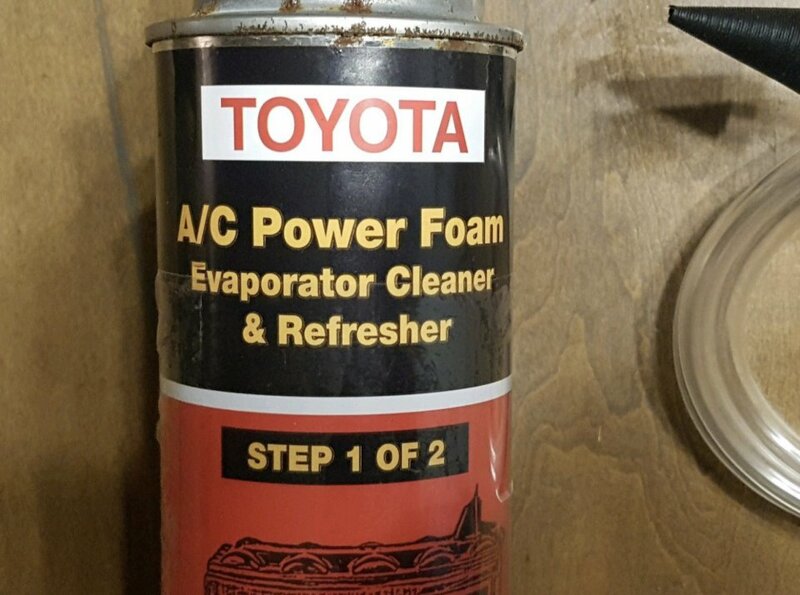 The Toyota system used to come as 2 parts one is the can pictured which is a pressurized microbial cleaner the other is an old lady stinkfest perfume your supposed to shoot into the fresh air vent/dam at the bottom of the windshield. I used to buy that Toyota system but always skipped the can of perfume part because it was disgusting and made the car stink worse than the mold. It accomplished nothing except stinking the car up more. The difficult part is getting under the car to attach the injection hose to the drip tube. One guy pulled the hose back into the car from the passenger seat floor but my luck I would damage it or it would come off the e-coil under the dash forcing a complete dash removal so I always just attached it to the hose under the car. The drip hose end is about 2 feet in from the back of the front passenger side tire. It only juts out of the bottom of the car about 3 inches so hard to find first time. Think just to the left of the glove compartment straight down. But worth the effort. I would do 2 cans if its the first time. Dealer used to charge $125 to do this service but not sure how much now. 2005 Prius bad EGR valve?